RALEIGH (WTVD) -- Imagine going weeks or even months without pay. That's what several former workers of a Raleigh mental health agency say they had to deal with on the job. Lauren Beasley worked as referral and outreach coordinator at Family Legacy Mental Health Services in Raleigh, but after working there a few months she started to notice something was wrong. When Beasley went to cash her December paycheck it came back as non-sufficient funds. She says she was eventually paid for that paycheck, but the paychecks that she was given for the work she did in February and March also came back as non-sufficient funds. Beasley said she started questioning other employees about having trouble getting their pay, and said she was laid off from Family Legacy. She says in total she is out $10,000 in gross pay for 3 months of work. "It's put us through a lot of hard times," she said. Beasley isn't the only employee who says they've had this problem. A now-former therapist at Family Legacy said the agency owes her $5,500 for her work there. "I asked every week, 'Am I getting paid?' and I would not get an answer," she said. She says the situation made it harder for her to serve her patients. "We are unable to do our job because we are not being compensated, and that's unfair for us and for the people that we serve," she said. It's the same situation for a case manager at Family Legacy. He said he's owed more than $11,000. All three workers said part of the situation is that you don't realize there may be a problem with getting paid until you've already worked two months without pay. They explained how Family Legacy's policy on pay worked. While they worked there, the policy was Family Legacy would issue a paycheck at the end of the month for the previous month's work. For example, if you work at Family Legacy, these part-time employees say, you're not paid for July work until the end of August. "I felt trapped," the therapist told us. "I needed to stay in order to collect a portion of the money but that's not happening now." Here is one of the emails a former worker shared with us that they received from the HR of Family Legacy about their pay. Beasley said her time with Family Legacy came to an end when she was laid off in May. Recently, she was paid on two of the non-sufficient funds checks, but says she's still owed her last paycheck of about $3,000. The others said that, without pay, they had to move on. They said they chose to speak out because Family Legacy continues to hire new workers and they said they're afraid those workers will also work several months for free. "Her goal is for her workers to continue to work even though they're not being compensated" the therapist said. I investigated and learned this is not the first time Family Legacy Mental Health Services has had a problem paying their employees. Since 2012, The NC Department of Labor tells me there have been 33 wage payment complaints filed with the state against Family Legacy Mental Health Services. Fourteen of those complaints are still open and last July, Family Legacy was found to be in violation of the Wage and Hour Act and fined $125. Besides problems with pay, I also found Family Legacy Mental Health Services had trouble paying their state and federal taxes. According to court records, Family Legacy owes $290,648 in 'back' state and federal taxes. This includes four state tax liens totaling $65,833 for back taxes in the final quarter of 2013 and the first three quarters of 2014 and one federal tax lien for $224,815 for taxes dating back to 2012. The owner of Family Legacy Mental Health Services is Lisa Stacey. Stacey said she would sit down and talk with us, but that has not happened. In an email, she said the cash flow problem were due to some of her staff not submitting billing, so there was not reimbursement to be had. 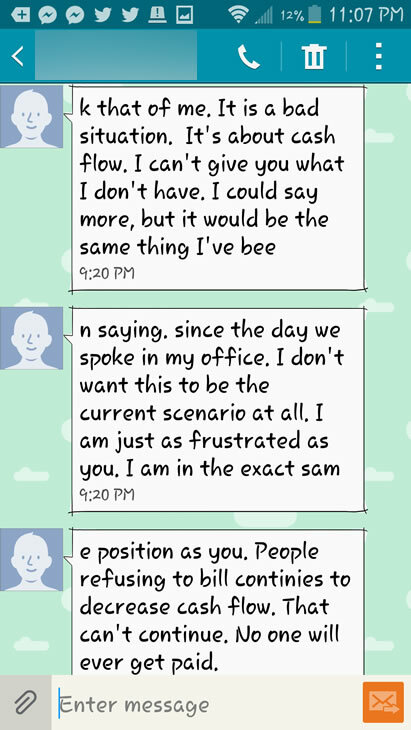 A former worker provided me with this text message she says is from Lisa Stacey when she questioned her about getting when she would get paid. Lisa Stacey also told me she blames some of the company's money troubles on a former employee who was convicted of embezzling money from Family Legacy. She added Family Legacy is a reputable highly ethical provider focused on holistic care. According to her, the company is going through a tough financial time, but they are working to overcome those obstacles so they can serve their clients. When I asked her about the company's state and federal tax liens of $290,648, she did not respond. Beasley, along with the other former workers of Family Legacy, tell us they don't understand Family Legacy's cash flow problem as the majority of their clients while working at Family Legacy were Medicaid recipients. "These are Medicaid funds, so that means it's our taxpayer money that's going to her hands and it's not coming back to us, but I still need to pay my taxes and I have a responsibility," the former Family Legacy case manager told us. I asked the NC Department of Health and Human Services if they're paying on Family Legacy's Medicaid claims, and a rep told me, "The provider has not received payment for claims due to an ongoing debt setoff. DMA [Division of Medical Assistance] has timely processed all claims submitted by this provider." When I questioned what the debt setoff was, the rep told me unpaid taxes. The state also provided me with this history of claims Family Legacy has filed from June 1, 2014-May 31, 2015. While the HealthChoice claims are paid by the state, the 4,379 Medicaid claims are Medicaid Encounter Claims and those are paid by an MCO (managed care organization) to the provider. A rep with the state tells me they contract with the LME-MCOs and pay the LME-MCOs a per member, per month, flat rate. LME-MCOs then contract with individual providers, set their own reimbursement rates, and pay the provider claims. The contracted reimbursement rate is between the LME-MCO and the provider. If you are having trouble getting paid in your job you can file a complaint with the NC Department of Labor. That phone number is (800) 625-2267. Here is a wage and hour fact sheet from the NCDOL: http://www.nclabor.com/wh/whfacts.htm.